mouse medicine: o christmas tree! the other day while I was visiting my folks I had the opportunity to speak with my sister - who lives an ocean and another hemisphere away. she was a bit blue about not having access to a 'traditional' christmas tree. so, to combat her blueness about not having verdant leaves to decorate, she resorted to what some affluent global villagers do. she logged on to her computer and ordered a tree from a cyberstore. unlike her cynical sister, that would be me, she believes that her home isn't complete unless it has a christmas tree (but in full disclosure, this year I am thinking I might see if I can find a nice looking branch on some forest floor to haul in and stick in a corner. I do have some lovely ornaments that haven't see the light of day in at least twelve years). also unlike me, who believes that if I actually resorted to such drastic measures as to order a tree from afar am certain that said tree would arrive sometime around may day, annie is hopeful that her tree will arrive prior to christmas day. 'tis the season of hope - n'est-ce pas? I wonder if annie remembers that she was a wee lass her 'family of origin' lived in a land with no traditional christmas trees. 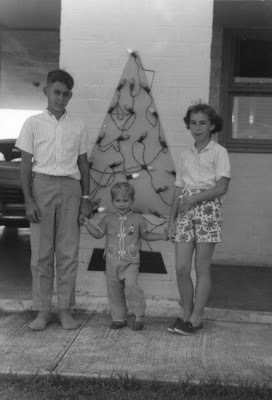 but, that didn't deter my enterprising parents they fashioned a tree out of a piece of plywood and strung it with lights. photo: from the family photo vault. 'the kids' photo taken by my dad. agana guam, 1965.
postscript added saturday 12.15 - last night while I was talking with ma she mentioned that unfortunately due to postal regulations (the tree was too big) annie's will not be able to get her mail-order tree. I hope she and her kids aren't too disappointed. but there's ten days left until santa flies in and necessity is the mother of invention - so no need to worry. I bet there may even be a lonely piece of plywood hanging about or what a good opportunity to come up with a totally new 'traditional' tree for the family's xmas in africa!